This week I will be unlocking my phone and taking you in for a look at how I organize my phone and what apps I keep on it. I do not like to have all my apps showing on my phone for two reasons. 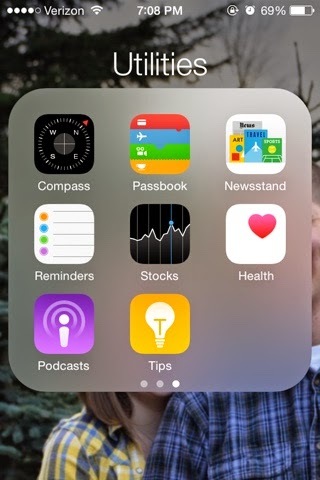 The first, I don't like people knowing every app on my phone and second, I am a compartmentalizer. Things are more organized and easier for me in my day to day life if they are in categories. I have four total folders on my phone some of which have multiple pages of their own. 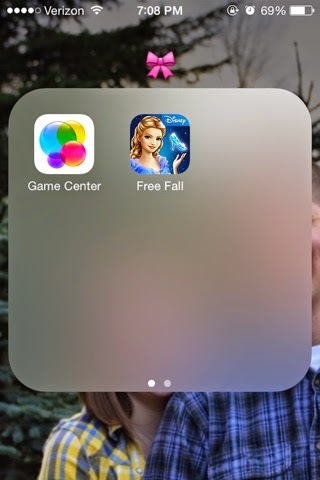 The first is my Utilities folder. 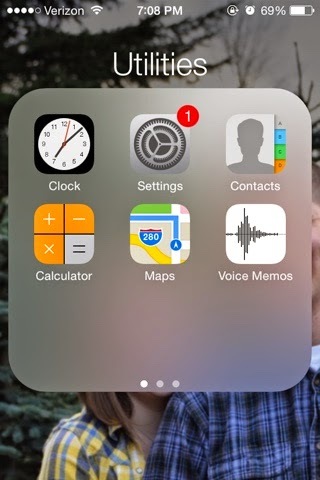 This particular folder has three pages and is the least used of all. I have this folder organized by apps that I would most commonly come use to least. Page one: These are my most commonly used utilities. However, I rarely use any of them except the alarm clock. I will sometimes grab for my Maps app when I have to drive to a new place. My lovely night in shinning armer usually drives. Page two: This would be my next to commonly used apps but I rarely click on it. I can FaceTime using the contact information. 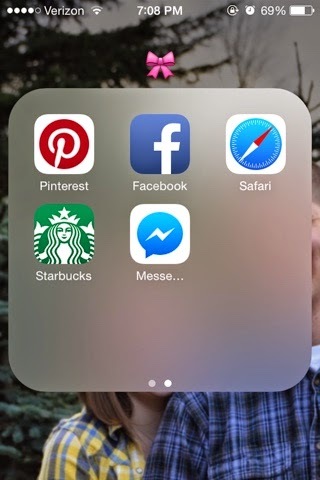 Page 3: These are the apps that I never use but apple won't let me delete them, otherwise I would. This folder is just for my pictures. 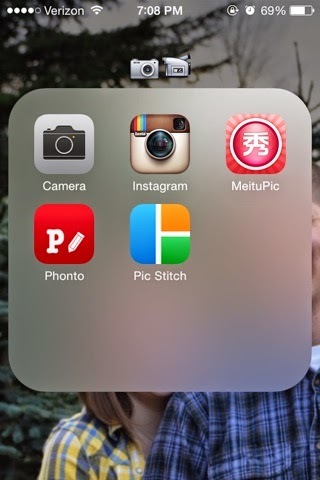 MeituPic is the best selfie app that you will ever find! Phonto is the best signature app. 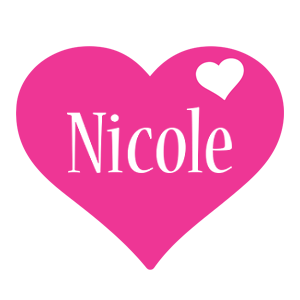 It also will save several different signatures so you can easily paste them on your photo. Pic Stitch is the best app to take multiple photos into a mix. Page one: This is where I keep my games. I really don't play many games and don't keep any games on my phone that I don't play often. Thats not something I have ever been into. Page two: The second page of apps in this category is my internet apps. 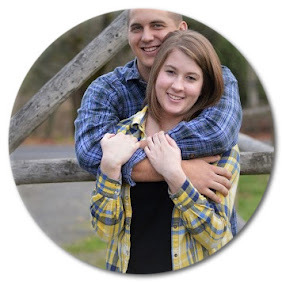 I use Pinterest often to get ideas or while I am waiting rather than playing a game. I only have Facebook and Messenger on my phone for my man. We send funny videos back and forth and I like to be able to check those while I am out and about. The last folder is my kiss folder. These are my most commonly used apps. The first page has my daily used apps. The Gmail app is what I use for my school email. My personal email is on the home screen. 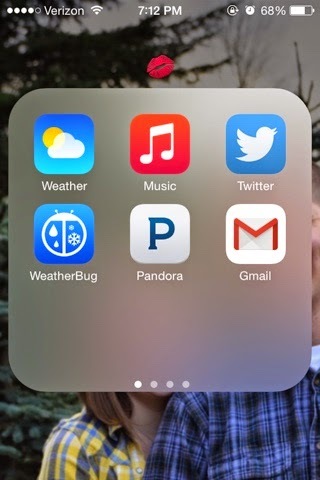 I also use Weatherbug and not the apple Weather app. I have found I get more information using Weatherbug than just Weather. The second page is my religion page. 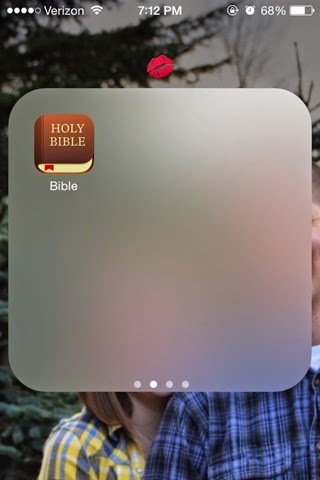 This used to be full of different visions of the Bible but I found that I only use this certain app. So I deleted the others and decided to save the space for what really works for me. The third page is my blogger page. I currently only have blogger on it but as I find the right blogger apps, I will add more. The very last page in this folder is my night time ones. Its my Book app and Video app. I usually only use these apps when I stay the night at someone's house. 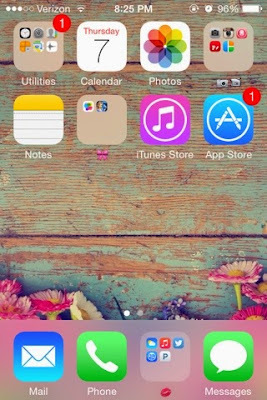 I hope this look into my phone put some ideas into your head about how you organized your own phone and what apps may need to be deleted and what apps you would like to add.